FREE USE OF LOCKERS - each guest will get a metal security locker to keep your valuables. DOMESTIC & INTERNATIONAL PAY (prepaid card & coin) PHONES ! Rates as low as USD0.05 per minute to the U.S.A. or the U.K.
(more countries to be announced soon ! Terms & Conditions apply. E-mail us for details. Please notify us directly of any changes/cancellation on your confirmed booking 72 hours ahead of your original stated time of arrival. Failure to do so will result in your credit card being charged for the WHOLE AMOUNT DUE. Please DO NOT book if you are not sure of honoring your booking contract ! Hostel Cosmopolitan imposes an alcohol-free and smoke-free policy in our premises upon recommendations from majority of our previous guests. We are basically an accommodation provider for all ages & guests' stress-free stay is our utmost priority. 'No-Shows' will result in your credit card being charged the WHOLE AMOUNT DUE. The Hostel has a resident cat on site, so those with an allergy may not want to stay here. Not for the faint-heart too ... ha ha ! - a 29' colour TV with over 40 channels including HBO, Cinemax, StarMovies, ESPN, Sports Channels, CNN, BBC, Al-Jazeera, Bloomberg, V-Channel, Mtv, etc. 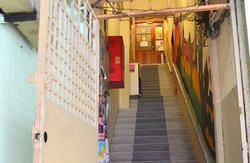 -Premises is equipped with a lift/elevator in a new & modern 5-storey building. - CCTV surveillance 24-hours in common areas. PIN Code to enter hostel. - Sufficient common bathrooms with separate shower & toilet cubicles (western sitting toilets). We have a total of 6 shower cubicles & 8 toilet cubicles, so no need to wait at all ! - In-house Laundry for only RM15 per load (max.5kg per load). Express Service also available for RM20, ready within 10 hours. - Luggage storage (for a small fee), kitchen facility, & ironing corner available. - Reception Opens : 8am - 11pm (however, check-in is available 24 hrs, subject to advance notice). Access to the room/bed is at 14:00 & beyond (earlier if available). - Transport assistance from KL Sentral to the Hostel & vice versa (from midnight to 6am) may be available. Charges apply. With individual fan & centrally air-conditioned. The rooms are without external windows. Shared bathroom. Lockers available. Bed sheet, towel, blanket provided. Each room has individual air-conditioner, without external windows, & has attached bathroom. Lockers available. Bedsheet, towel, blanket provided. Individually air-conditioned & fan. Rooms are without external windows. Small metal lockers located in the hallway. Bed sheet provided. Towel & blanket available for rental. With fan only (no A/C). Room is without external windows. Small metal lockers located in the hallway. Bed sheet provided. Towel & blanket available for rental. With fan only (no A/C). Room has city/street view. Small metal lockers located in the hallway. Bed sheet provided. Towel & blanket available for rental. This dorm has an 'open' concept, i.e. with only curtains & no solid door, but has the best view of the street in front from the 3rd Floor. Room is individually air-conditioned & without external windows. Each bunk-bed has a night-light, power socket, & large metal locker near each bed. Bed sheet provided. Towel & blanket available for rental. At Hostel Cosmopolitan, you'll get the best deal in town & best value for your money ! Come see for yourself to believe it ! We are not No.1 (yet), so we try harder ! 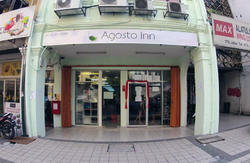 We are also 1 min walk from the 20-storey Hotel Brisdale (which is opposite Chow Kit Fire Station) on Jalan Haji Hussein. - take the half-hourly 'Airport Coach' bus(75 minutes, RM10.00). (There is also a shuttle bus from LCCT to the Main Terminal (and vice versa) for RM1.50 (20 mins one-way) if you prefer taking the KLIA Ekspress to KL Sentral Terminal). Airport Taxi from either the Main or LCC Terminal, costs approximately RM75 per car (with 50% midnight surcharge for travels between 00:00 - 06:00). - take the intra-city commuter train, 'Monorail', to its Chow Kit station (17 minutes, RM2.50). Note : The KL Sentral 'Monorail' station is not located within the KL Sentral building but 5 minutes walk across the street called 'Jalan Tun Sambanthan'. take a taxi for approximately RM40 for per car to the Hostel. No direct bus or train is available from SAAS Airport to KL city centre. - take the Ampang-line or Sri Petaling-line 'LRT' (Light Rail Transit) (formerly known as Star-LRT) from Plaza Rakyat station or Masjid Jamek station, to PWTC station (8 minutes, RM1.20). From LRT line at PWTC station, see directions below. Alternatively, go all the way to Titiwangsa station, then switch to the Monorail line to Chow Kit station.